IT recruitment can feel like a hunt for the holy grail. You need someone with a very specific set of skills and certifications, yet you can’t always pay as much as the tech giants scooping them up. We’re here to tell you it doesn’t need to be. When you adopt a structured IT recruiting process using a system like Indeed, you’ll expand your candidate pool, and review more applications in less time. In this article, we’ll walk you through the 7 steps of IT recruitment, starting with your job description, and ending with your offer letter. Thanks to Indeed for sponsoring this article. The first step is to write a strong job description for your new IT position. Job descriptions are tricky: It’s the primary way you ‘sell’ the position as an exciting opportunity, yet you only have so many words to do so. In fact, 1 in 5 candidates will skip your application process if it takes longer than 20 minutes to complete, so it’s vital to keep things short and on-point. Systems Administrator – Responsible for implementing and supporting a broad range of technology, including hardware and software; does not typically design custom software. Systems Engineer – Designs the system an administrator installs; generally more common in medium and large enterprises. Analytics Manager – Responsible for tracking and interpreting data, such as customer, or sales metrics. Software Developer – Creates, designs, or maintains custom software; Can refer to wide range of languages/applications. Web Developer – Works exclusively with websites and web-based applications. As you can probably tell already, subtle changes in wording can mean vastly different things in the IT world. You need to make sure your job title is accurate to attract the right talent. 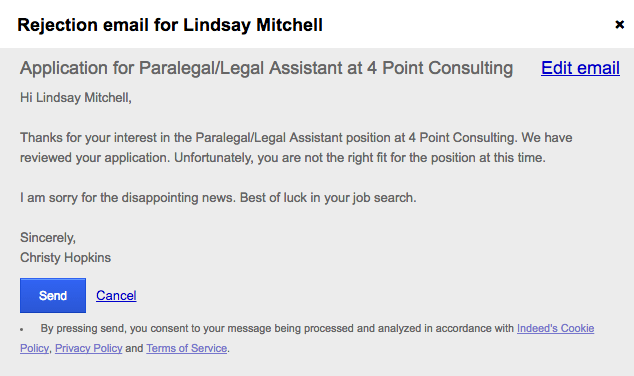 A poorly-chosen job title can also make your job ad more difficult to find. For example, even though the two terms are sometimes used interchangeably, “developer” is searched 15x more often than “programmer.” Granted, the latter usually refers to those who exclusively write code, while ‘developer’ can include design, programming, testing and support. You can see for yourself which job titles candidates are searching for using Indeed’s Job Trends tool. Your ‘about us’ section is a brief 3-5 sentence paragraph that answers who you are and what you do. Since anyone who comes across your job ad has likely also seen competitors, this section should emphasize why your business is unique, and why they should consider working for you instead. This section should list the main day-to-day responsibilities of the position. To complete this section, you should first list all the tasks — big and small — the employee will complete, along with the estimated hours associated with each. This will help you confirm the hours (full time vs part time) and skills required for the role. If you’re not an IT expert yourself, make sure you consult an expert on your team for advice. When it comes to the actual job description, just list the main daily tasks. You don’t want to intimidate potential applicants, or leave the impression they’ll be micro-managed. By now, you should have a pretty solid picture of your new job role — including whether it’s a junior or senior position, and what their responsibilities will be. Now comes the tricky task of breaking things down to a list of qualifications. First and foremost, which systems and/or languages will the candidate need to use? For each one, note the level of experience they’ll need, ranging from fully-certified to ‘some’ experience. Another way to get insights on what skills to list in your job description is to look at IT resumes that can be viewed for free in Indeed. You’ll see what IT people with different technical experience put on their resume. Maybe they list things like ‘business requirements gathering’. Your job description may want to list those skills too. Sure, Millennials follow their hearts when choosing a career. 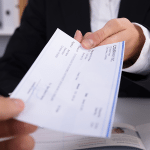 But studies have repeatedly shown that salary and benefits are still the biggest factors candidates consider when applying for, or considering a job offer (CareerBuilder). Including your job’s salary range and benefits will mean more attentive eyes on the application. 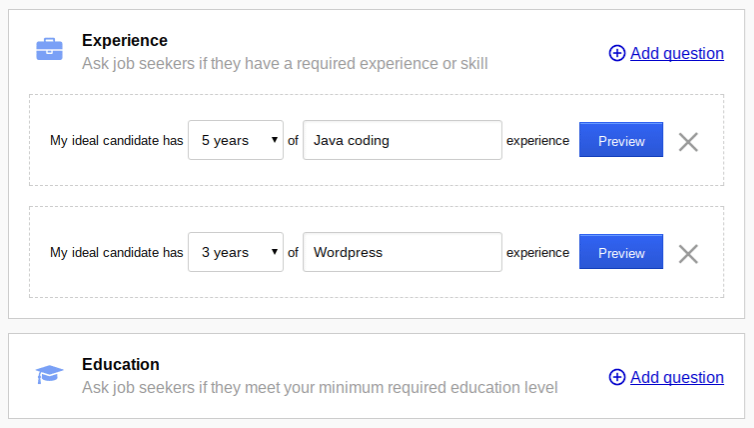 Notice we said range: Your salary should be listed as a range with a 25-30% difference depending on experience (e.g. $60,000-80,000 DOE). System Administrators in the US currently earn an average annual salary of $75,678. System Engineers earn $86,767. You can see how other titles compare using Indeed’s salary comparison tool or by calculating a compa ratio. See our articles to learn more about how to create a compensation plan and how to offer employee benefits. If you’ve hired before, you know there’s no one right way to find candidates; sometimes they come to you, and other times you find them. 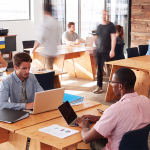 By and large, the most successful employers embrace both methods to reach the widest possible pool of candidates: They actively seek talent, and set themselves up so talent is consistently coming to them. This is why we’ll be highlighting Indeed.com as the place to start your search. Being both the largest job board website in the US, and a huge resume database, Indeed is perfect for both passive and active recruiting of top IT talent. First off, if you haven’t already, head to Indeed.com and create a free employer account. Once registered, you’ll be prompted right away to create a job advertisement. What follows is several, easy, fill-in-the-blank step, like adding your job title, location and description. Be sure to take advantage of Indeed’s qualifying questions in step 5. You can use these to ask candidates how many years of experience they have in a particular field(s). Those who do not meet the minimum requirements can be automatically disqualified. Indeed Candidate Questionnaire: Require candidates to answer questions about their experience and qualifications. 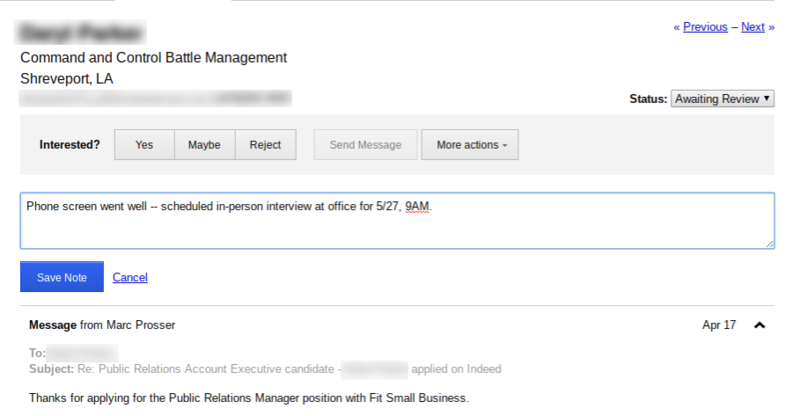 With your job ad now posted, it will start appearing in search results when candidates in your area browse for jobs. If you want to get more applicants, however, you can learn how to get the most out of your Indeed job ad with sponsored posting, or learn about sourcing candidates next. As we mentioned before, posting your job on Indeed is only half the picture. Sure, your ad will be visible to anybody currently searching for jobs. But what about the many qualified IT candidates who aren’t searching, yet would consider leaving their job for a better offer? This is why we recommend taking some extra time to find qualified candidates and invite them to apply for your job. Again, Indeed makes this easy by providing a vast database of up-to-date resumes. You can browse it yourself, or, allow Indeed to automatically recommend candidates based on the criteria in your job description. 2. From there, you’ll be redirected to Indeed’s resume database. Right away, Indeed will provide a list of suggested candidates. If there’s anybody you would like to contact and invite to apply for your job, you can do this at a cost of $1 per candidate. 3. To expand your search even further, you can enter a keyword in the search bar, and/or use filters on the left toolbar, including Job Title, Years of Work Experience, Education and more. If you still aren’t happy with the results, click “Advanced Search” and you can enter more specific keywords. When you reject a candidate, Indeed will prompt you to send a pre-written rejection letter that thanks them for applying, but informs them they will not be considered for the job. You can write your own, or use the template provided by Indeed. For your “Maybe” pile, you should also send them a notification. Thank them for applying, and let them know you’ll be in touch in a week or two. Then, once you have some more applications, you can decide if it’s worth moving forward with any candidates. For the candidates you want to move forward with, the next step is to conduct a phone interview. This is a brief 20-minute call that lets you get a feel for each candidate. 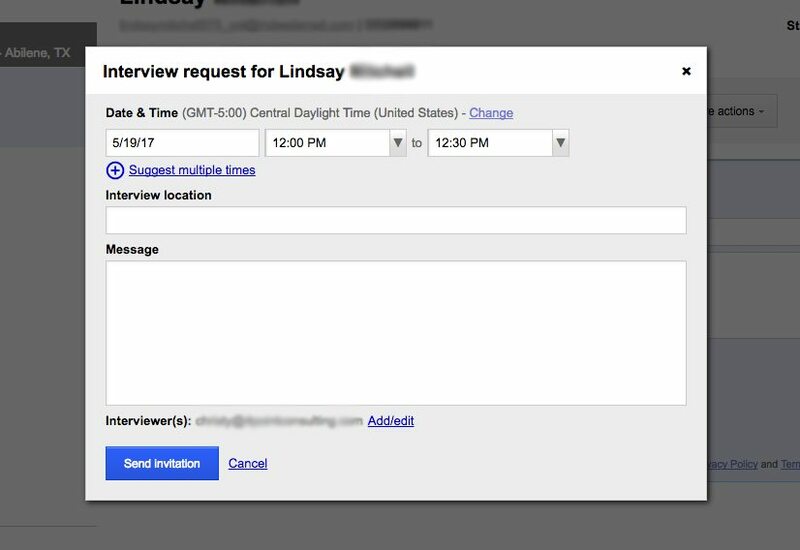 Later on, you’ll invite your top picks to an in-person interview at your office. The reason for a phone screen rule out any less-than-exemplary candidates right away. Your phone screen questions should focus on their resume. For example, if they said they’re a Java expert, ask about their experience. Confirm they are, in fact, an expert coder, and not simply exaggerating their skills. For more advice on what to ask, check out our free phone screen templates. Remember to take thorough notes during each interview. This will help you review and compare candidates later, and defend your hiring decision in the rare circumstance of a legal accusation. Indeed allows you to save notes directly on each candidate’s application. After completing your phone screens, you should pick out your 3-5 favorite candidates to meet for an in-person interview. This is a longer and more detailed interview, where you’ll get to know each candidate personally, and gauge how well they’ll interact with you and your team. Before the date draws near, make sure you know who will sit in on the interview, where it will take place (conference room? ), and what questions you’ll be asking. Many employers prefer a structured interview, which makes it easier to compare candidates and minimizes legal risks. Technical questions specific to the system(s) they’ll be using on the job. Problem-solving questions that test their general creativity and talent. Soft-skill questions focused on their ability to work with a team, and/or work under pressure. If you’re not an IT expert yourself, you should consult a team member to come up with technical questions. Ideally, you can also have them sit-in on the interview to gauge the candidate’s response, and ask any follow-up questions, if needed. Problem-solving questions are more general. These can be asked by a non-IT expert, as they do not pertain to a specific language or system. For example, you might ask them, how many traffic signals are there in your city? Explain how you arrived at the number. This shows you how thoroughly and quickly they work through a problem. Depending on your hiring needs, you might score the most accurate, or the most creative answer the highest. Soft-skill questions are not technical at all, but rather, focus on what kind of employee they’ll be. You might ask them, how would you handle a client situation where the deliverable deadline is approaching, and your team members may not be available to help? For these, pay attention to the most realistic answers, and look out for candidates who are only telling you what you want to hear. Check out more ideas in our guide to the best interview questions. IT jobs are unique in that a huge part of your hiring decision will rest on their technical knowledge. A candidate can be a great problem solver, but if they don’t know Java well, they aren’t going to be your new Java developer. You’ve asked them questions already to confirm their knowledge, but now it’s time to really put their skills to the test. Assign them a project as though they’re already working for your business. This can be an actual assignment you need completed for your business — just make sure they’re being compensated whether or not you hire them. Systems Administrator: Brief them on the most recent network issue reported by an employee. Ask them to write a report on how they would go about solving it. Analytics Manager: Give them a set of data about your customers (e.g. purchases made in last 12 months) and ask them to produce a visual report and note any significant trends they find. Software Developer: Ask them to design (or write) a simple application you’re currently looking to implement. Based on the results of this project, you should now be down to your final few candidates. If there’s a single, obvious winner, you can jump ahead to step 7. Otherwise, the next step is to round up your hiring managers to make a decision. In addition, you should now have their test project results, and any reference check notes, or LinkedIn feedback you collected. In other words; everything you need to thoroughly compare each candidate. It’s a good practice to include other team members at this point, especially anyone the new employee will be working under. They may notice a red flag you missed earlier — or, perhaps they’re less bothered by a candidate’s weak point. Either way, consulting team members will ensure everybody is on the same page and excited about the new hire. Up until now, the candidates have competed to impress the business owner and/or hiring managers. Now, the tables have shifted, and it’s your turn to impress the candidate. Call and give a verbal offer over the phone (note: this can be held up in court, so don’t hint at any offers you aren’t prepared to fulfill). Call or email, and ask the candidate to meet in person as soon as possible to present the offer. Once you have given them the offer, allow the candidate some time (24-72 hours) to review the offer and ask questions before requiring a response. Unlike a large business, IT recruitment for a small business usually requires candidates with a broad range of skills. This, unfortunately, can get tricky. With a long list of skills and certifications needed, your dream candidate may feel about as rare as a unicorn. Small businesses can improve their odds by following a structured hiring process. This will help you cast the widest possible net — by both attracting candidates with a solid job description, and reeling candidates in who fit your description. Head over to Indeed.com to start posting for free.